Professional regular hold mousse, ideal for creating natural-looking silky, shiny blow dry styles and well defined curls. Also perfect for creating sculpted and 'messy' wet looks. With extracts or Willow and Honey. 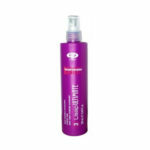 Spray Revitalizing moisturizing properties. It protects hair against heat. It contains keratin, the latest generation of silicones and nutrients cationic complexes. Protects against moisture, improves hair structure and providing them optimum conditions when using a hair straightener, curling iron or hair dryer.